We’ve heard of highlights and lowlights, but we never imagined underlights until right now — and they are awesome. If you’re looking to change up your hair for the summer season with something bright and fun, but you’re not ready to commit to mermaid hair or a funky undercut (or perhaps work would have your head if you did), then the hair trend you’ve been holding out for is here. 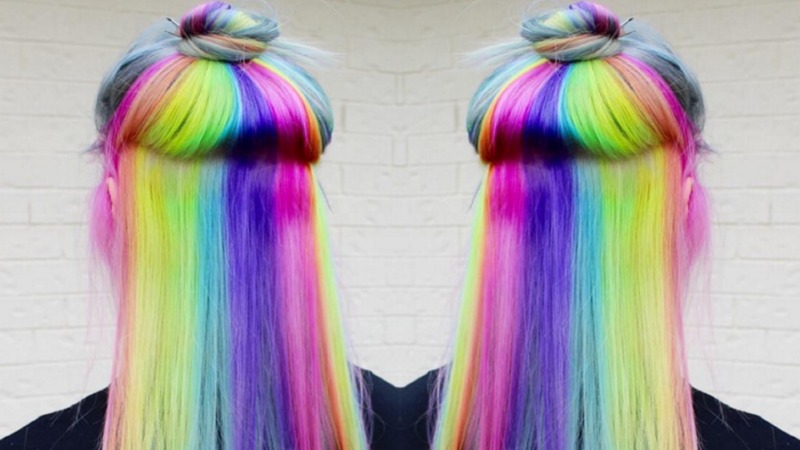 It’s basically the new way to wear unicorn-approved hair, but in secret. The process involves colouring the underside of your hair in the bright colours of the rainbow, and the results are absolutely stunning. Take 2!!! I had so much fun with this creation today! Thank you again @ash_uh__ley! Also a big thank you to @xostylistxo and @badashhair for your amazing color class. Forget Fifty Shades of Grey — it’s all about 50 shades of pink! Perhaps one of the best things about this trend is that it’s not limited to lighter hair shades. If you want to make a statement, this is definitely one of the easiest trends to try out. The trend is really taking off, and it looks to be the next hot look for 2016. But would you try underlights? Let us know in the comments below.